At Saracen, valuation is at the heart of everything we do. We remain convinced that buying a good business at an inflated valuation is a poor investment. 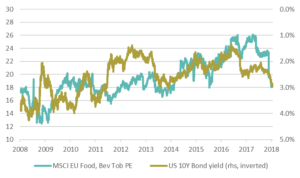 For most of the last three years we have talked about the stretched valuations for many businesses in the staples sector, where the appreciation in their share prices appeared more related to their comparison to bond yields, rather than any improvement in their earnings outlook. The tide has now turned. Global economic growth has persisted and there is less requirement for Central Banks to buy bonds to depress interest rates. 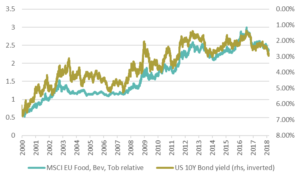 The Fed has turned from a net buyer of bonds to a net seller and the European Central Bank (ECB) has reduced the amount of bond buying. 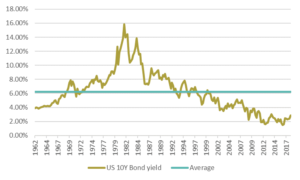 The combination of these factors has led to a fall in bond prices and rise in yields. This process towards normalisation still has some way to go (see chart below). There are now expectations that the Fed might hike 3 or even 4 times this year, followed by another 4 times next year. While the ECB is quite a bit behind, growth in the Eurozone is strengthening and there is potential for a rate rise towards the end of 2018. We would expect this scenario to maintain downward pressure on bond prices. While some market participants think the underperformance has run its course, we believe it is only the beginning of a longer-term trend. Competition remains fierce and we expect earnings growth to remain subdued while the shares are often still on demanding valuations. Valuation is not the only obstacle holding us back from investing in this space at present. We have said for a while that the dividend yields on the Staples are not sustainable. 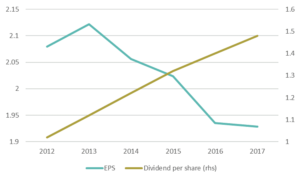 In specific, we have highlighted Coca-Cola for the last 2 years as an example where the dividend pay-out ratio has reached unsustainable levels and where shareholder returns went hand in hand with increased leverage. Over the last 5 years Coca-Cola has reported declining EPS (from $2.12 in 2013 to $1.93 in 2017), yet its dividend increased every year (from $1.12 in 2013 to 1.48 in 2017). 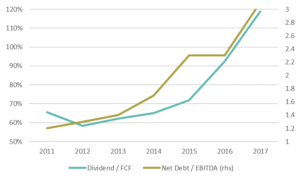 Looking at the cash flow statement, the total dividend payment from the company represented 62% of FCF (free cash flow) in 2013. This rose to 119% in 2017! It is quite clear that the only way Coca-Cola was able to continue its progressive dividend was by increasing its leverage. In fact, over the last 6 years its net debt to EBITDA ratio rose from 1.2x to 3.1x. Coca-Cola is not alone in adding leverage. Across the staples space, net debt has tripled since 2009 (from 1x to 3x), while the rest of the market actually de-levered from 5.3x to 3.3x. Part of this increased leverage was used to return money to shareholders via dividends and / or share buy backs, which boosted earnings per share. 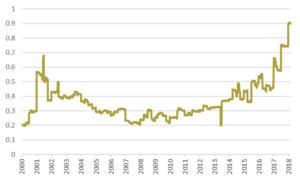 However, some companies also increased borrowings to acquire businesses at arguably stretched valuations in order to bolster underwhelming top line growth. 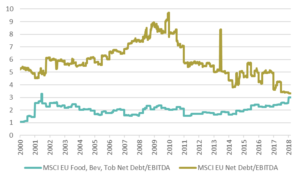 For example, ABI Inbev’s net debt/EBITDA rose to 6.6x after the SABMiller acquisitions. Reckitt Benckiser bought Mead Johnson with debt (and equity) and geared up to 3.7x, while Danone’s leverage ratio reached 4.2x after it acquired WhiteWave. The list goes on. 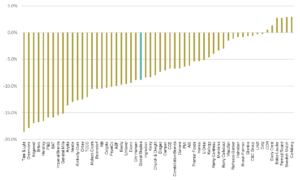 Extended leverage ratios can be accommodated in high cash generative businesses. 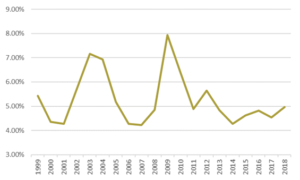 However, cash generation within the Staples sector has slowed in recent years. When interest rates rise and companies have to refinance their relatively stretched balance sheets at higher interest rates there will be an impact on earnings and cash flow. It is possible that dividends will be under pressure. All this is happening at a time when the fundamental backdrop for FMCG companies has deteriorated. We have long argued that top line growth expectations are optimistic. 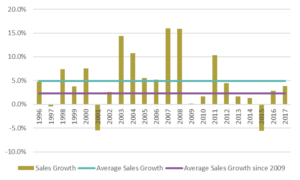 The average sales growth over the last ten years was 5%. However, this was inflated by the Emerging Market boom in the early 2000s. Over the last 5 years this growth rate has more than halved to 2.3%. We do not believe we are going back to the 5% growth rates that many investors are expecting. Many companies are experiencing increased competition from niche players who are more nimble and better attuned to consumer needs and wants. In particular, e-commerce is offering greater choice to consumers and negating economies of scale. When volumes are persistently low, especially in developed markets and when pricing power is eroding, revenue growth is under pressure. 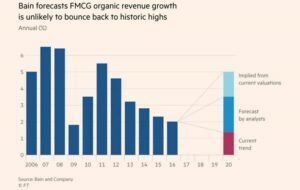 This was reiterated in a recent study by Bain and Company, which also does not expect FMCG organic revenue growth to bounce back to historic highs. When we first launched TB Saracen Global Income & Growth, we had 27% of the portfolio invested in Consumer shares. Today, this stands at 4%. Several companies are resurfacing on our weekly company screens. 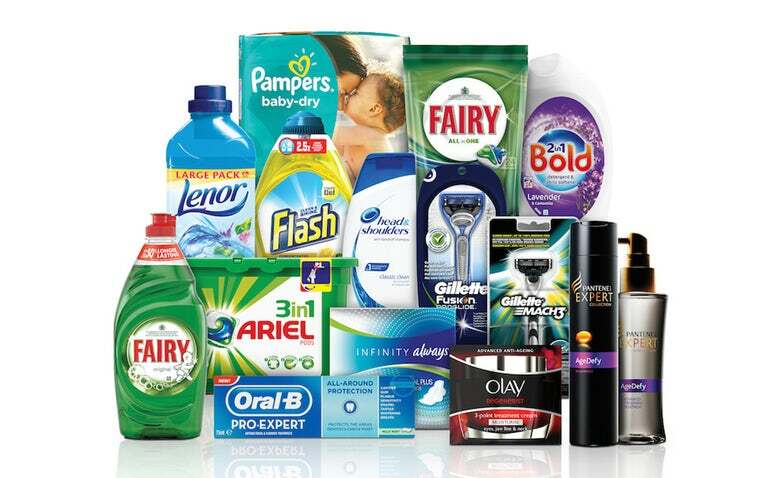 Some Staples companies are amongst the world’s best run companies and we expect to own them again in the future, but at a price that more suitably reflects their earnings growth. However, the combination of increased leverage, still elevated valuations and a subdued growth outlook, means that we still think it’s too early to reinvest.